Through charitable organizations such as TheGivingPledge the likes of Bill Gates, Paul Allen, Larry Ellison, Warren Buffett and Michael Bloomberg have all made big news with huge monetary donations. Is it me or are the mega-affluent finally getting the message? Well, the message I’m getting is rather mixed. I also would be remiss if I didn’t give a shout out to those all-important tax write-offs. Great. So ROI is an important consideration when engaging in philanthropic “investing.” I suppose I shouldn’t be too shocked. But whatever happened to doing it purely because it was the noble thing to do? 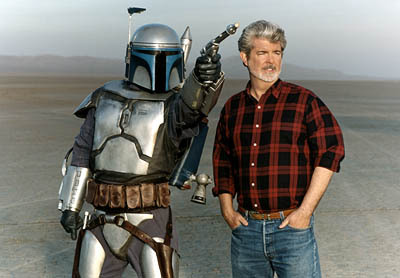 Enter Mr. “I want to send all the right messages in my work” George Lucas. Aside from allocating the majority of his fortune to charity through TheGivingPledge, he also spearheads Edutopia which uses his Lucasfilm CG and Skywalker Sound technologies to enhance education for a video game generation; as well as Artists for a New South Africa which is championing the fight against AIDS becoming a pandemic. Mr. Lucas also participates in the Racing For Kids program where celebrities visit children’s hospitals in racing communities. And then there is his true passion – filmmaking. Through his Lucasfilm Foundation, Mr. Lucas also pledged $175-million to his University of Southern California alma mater, the school’s largest ever donation, to build a new 137,000 square foot complex for its film school. Of the more than 40 iconic members of TheGivingPledge, George Lucas is Hollywood’s only representative. Just think… all those stars emblazoned on Hollywood Boulevard’s walk of fame and he’s the only one to donate most of an immense personal nestegg. Please understand that isn’t a slam on celebrities. There are countless celebs who donate both sizable funds and their own precious time to affect positive change in this world. All who do are to be revered for their efforts. But over half of a $multi-BILLION personal fortune? Folks… THAT is stepping up to the plate.